I recently did an interview! You can read it here or read it below! For a long time, I’ve been an avid fan of ComputeHer, the adorable alter-ego of 8-bit musician extraordinaire Michelle Sternberger. Michelle, who is also in the totally awesome chiptune band 8 Bit Weapon with her hubby Seth (pause for audible “awww”), was sweet enough to take the time out from her busy schedule to answer a few questions – well, okay, more than a few – for myself and all you readers. Check out what she had to say about the 8-bit music industry, her band and solo project, and what’s to come! All photos below were taken by and belong to Rachel McCauley. So first things first, for those who don’t know, what exactly is chiptune/8-bit music? Chiptune music is music written using a computer sound chip and/or a video game console sound chip using home-brewed cartridges. I write most of my music using my 1989 Nintendo Game Boy. I use a cartridge called Little Sound DJ which is a home-brewed cartridge created by Johan Kotlinski. Little Sound DJ turns my Game Boy into a sequencer. The 8-bit music industry doesn’t seem to be too much at the forefront here in the US and Canada, though it is already growing considerably in the UK and Japan. Why do you think this music scene might be so underground still? Do you sense this is changing? What kind of instruments/gadgets do you personally like to use to create your tunes? I like to use my Game Boy, NES, Commodore 64, Apple ii and just recently I got an omni-chord which I’ll be using on my next album. I also have a lot of toy keyboards that are fun to play with. Is it a difficult process to actually create music by using 8-bit computers and “outdated” video game consoles? The only difficult aspect of creating music with old consoles and computers is finding machines that aren’t faulty. Just recently I got a NES to create music with and it didn’t work and was loading a blank screen and the light kept flashing. I then tried another NES and it gave me the same problem. The Game Boy that I wrote my album Data Bass with just loaded a blank screen and is totally dead. So now I need to find a new Game Boy. It’s rare to find a console or computer that has never been used and most of the time I’m using a computer or game console with some sort of quirk or glitch. How did you learn or teach yourself how to make this kind of music? I’d imagine a lot of experimenting went into the learning process! You’re right; a lot of experimenting went into the learning process. All of my songs on Data Bass were an experiment of some sorts. I wasn’t even sure I was going to write an album in the first place when I first began making chiptunes. It was more of a fun side project that I got into and I ended up writing a handful of songs and decided to put out an album. I taught myself how to use LSDJ by using the tutorials on the website http://www.littlesounddj.com and by also learning from others who are in the chiptune world. Since there are really no lyrics to think about when writing your music, where do you get the inspiration from when making a song or getting the right sound? I never really start a song with the intention of writing a specific style or getting a specific sound. It is kinda like I think to myself: Maybe I’ll try to write a song and if I create something I like, I’ll keep it. I usually start out with the drums since I’m originally a drummer. Then I’ll work off of the drums by writing a bass line or something. Inspiration is usually when I’m in a good mood or in a good place in my mind. I have never picked up my music when I’m not feeling good. So I guess the inspiration is happiness. 🙂 Perhaps my music would be different if I did it the other way around. I have never tried that. Though ComputeHer consisted of really no vocals, you seem to do some limited vocals/singing in 8 Bit Weapon. What can you tell us about your choice to sing in 8 Bit Weapon and not for ComputeHer? I felt like it was time I tried out singing and the opportunity presented itself during the recording of Electric High for 8 Bit Weapon. I was really paranoid at first with the way I sounded, but then I got over it and stopped caring. I am thinking of adding vocals to my next solo album because I realized that I am always singing along to other people’s songs and one of my favorite aspects of music are the lyrics! I have never recorded vocals in my life and it never occurred to me to do that during my experiments with my solo band because my main focus back then was learning how to create chiptunes. On future albums, expect to hear more vocals from me and more dynamic from my music. I hope to continue to grow as an artist in every way possible. What’s a bigger influence on the music: the future or the past? I think if I were to write music with more lyrics then the past would be more of an inspiration because I could draw from experience and ideas. 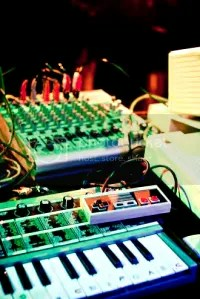 Though your music is made using items such as old Commodore computers, Game Boys, and synthesizers, your music from both ComputeHer and 8 Bit Weapon have a modern, yet nostalgic, electro-pop sound. How do you avoid making tunes that sound like video game soundtracks altogether? I think by adding drums that aren’t built of off sound-FX makes my music sound more modern. I find when I listen to chiptune artists who don’t use drums, it’s as though I am listening to a video game soundtrack. We also use synthesizers that aren’t chiptune-related. Speaking of video games, what do you like to play? I have a hunch you’re an old school gamer, but maybe I’m wrong! Well, I grew up with the Commodore 64 so I loved to play Little Computer People and Ughlympics. When the NES came out I played Maniac Mansion a lot and of course Mario Brothers. I also play theXxbox 360. I like Burnout, Fable II and Peggle. Okay, let’s talk about the music now! You started out as a solo 8-bit artist under the name ComputeHer – brilliant, by the way – creating sweet, melodic bit-pop tunes sans vocals or lyrics. When and why did you decide to start this project and are you currently still involved with it? I was given LSDJ and a Game Boy as a gift in 2005 and that’s when I started experimenting with different sounds and began learning the process of making chiptunes. After I had a handful of songs, I posted my songs on MySpace to show my friends and family what I was doing. I was soon approached by someone who was making a game with Mark Mothersbaugh of DEVO, who needed sound FX! Needless to say, I was in shock and ecstatic about the opportunity. Being a big fan of Devo, I couldn’t let the opportunity slip out of my hands and I decided to get really serious about my music and my band ComputeHer was created with a future in mind. Then in 2006, I released my album Data Bass with the money I made from the sound FX I created for Mark Mothersbaugh. The game unfortunately was never released, but it was a launch pad for my band. I am currently involved with ComputeHer and am working on a new album as we speak! In 2006, you joined Seth Sternberger in his 8-bit electro-pop project, 8 Bit Weapon. When did you and Seth meet and what initially drew you into joining? Seth and I met in 2004 when I heard there was a band playing in Hollywood using Commodore 64s. Being a big C64 gamer growing up, I had to see his band. We soon started hanging out after that and realized we had a lot in common and began dating. I’ve been in and out of garage bands during high school so it only seemed natural that we’d eventually start making our own music. What can you tell me about Seth’s and your role in the band? Ex: How do you two work together? What’s the dynamic like? Who does what? We are married now so whenever we feel like making music we head into the studio and start laying down our ideas. We have a few unreleased songs that we have both written which will be on the next album. At first I mostly did a lot of technical things for 8 Bit Weapon. I’d do visuals for live sets on the Apple ii and I’d played electronic drums when we toured in Europe. I’d play Game Boy on a few songs too. My focus was mostly ComputeHer until we decided it made sense to put both of us in 8 Bit Weapon to see how far we could take the band. On our first song that we worked together, “Closer,” we decided to round out the song by adding vocals which I helped write the lyrics for. How would you describe 8 Bit Weapon’s music? It’s modern pop rock with a nostalgic twist. You guys have recently in the past few years become very well-known in the gaming circuit (oh, gee, excuse the pun!) what with your various performances at E3 (the Electronic Entertainment Expo) and other activities within the industry. Has this kind of exposure had any impact on you as an artist? I’d imagine it’s really propelled the band’s career! It’s definitely helped propel the band which otherwise would have been harder to do without that kind of exposure and opportunity. It seems whenever we get a gig like that, another door will open for us of opportunities. We always have a project going on. As soon as a project ends, another project pops up. It’s been a lot of fun working with so many different people. Currently we are working on a project for Electric Arts. I heard you guys were asked to perform at the Commodore 64 25th Anniversary in 2007… That must have been a really cool and proud moment! What was that like for you? It was a real honor, and to be there with the people from the original Commodore Company was a once in a lifetime experience. Bill “the Animal” Herd, the Father of the Commodore 128, even signed our c128! What is in store right now for the future of 8 Bit Weapon? What can fans expect from you guys within the next year? My solo album will be out this year and we’re working on a Holiday album for December. Also, we’ll be releasing a game called Silo 64 and the soundtrack to that game in 2010. We have a lot that our fans can expect. 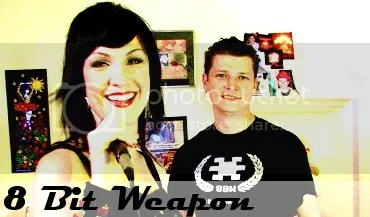 Seth and I will also be writing new music for the next 8 Bit Weapon album. Is there anything else at all you’d like to say or address to your fans? Thanks to everyone for their support. We really appreciate it! If anyone is interested in making their own chiptune music they can purchase a loop library that we made for Sony athttp://www.sonycreativesoftware.com/8bitweapon. With the library, we’ve done all the gritty work for you by recording the sounds from our very own consoles and computers. There are many explosions, blips and bleeps to choose from. All you’ll have to do is arrange them to your liking. The loops can be used in Acid, Garageband, Ableton, Beatmaker for iPhone and many other programs. With purchase of the downloadable version of the loop library you will also get a copy of our album Electric High! You can find more information about us on our websites www.computeher.netand www.8bitweapon.com. We are also on the social networks Facebook, MySpaceand Twitter. Well, there you have it! Visit one of the sites there to find out more, listen, and download some sweet 8-bit tracks. Thank you so much, Michelle!